This book is currently available here. "Katherine Chen's richly researched volume provides a much needed sociological analysis [of Burning Man]... she offers an original and important analytical account of what happens when bohemian modes of sociability meet bureaucratic forms of organization." - Fred Turner, Stanford University, 2010 book review for Contemporary Sociology 39(3): 289-291. "Chen's analysis of Burning Man is likely to be particularly useful for those who lead, study, and teach about voluntary and non-profit organizations... Enabling Creative Chaos is ultimately a strong ethnography of an extremely interesting and unique organization that provides considerable grist for thinking about broad organizing processes. It is also an interesting read about one of the strangest social events of our time." "Enabling Creative Chaos is topical, smart, and interesting." - Francesca Polletta, University of California at Irvine, 2010 book review for American Journal of Sociology 116(1): 294-296. "In this meticulous ethnographic account of the staging of a major American countercultural festival, sociologist Katherine Chen has given us a glimpse of a possible future of organizing..."
- John Sherry, Jr., Mendoza College of Business, University of Notre Dame, 2010 book review for Journal of Consumer Culture 10: 407. The annual Burning Man arts festival is a countercultural phenomenon that interests popular culture enthusiasts, innovators, environmentalists, social scientists, and management specialists. 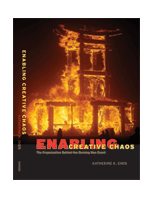 Enabling Creative Chaos examines how a small group transformed themselves into an unconventional corporation with a ten-million-dollar budget and two thousand volunteers. Founded on a commitment to expression and community, Burning Man drew more than 50,000 people to an isolated Nevada desert in the summer of 2010. Katherine K. Chen, a sociologist who participated in organizing activities during four years, shows how organizers experimented with different management models; learned how to recruit, motivate, and retain volunteers; and developed strategies to handle regulatory agencies and the media. Burning Man's development offers important lessons for the management of organizations, particularly during uncertain times. Katherine K. Chen is assistant professor of sociology at The City College of New York and the Graduate Center, The City University of New York (CUNY).